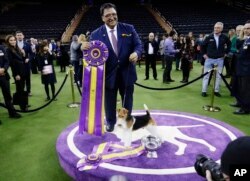 At the Westminster Dog Show in New York, wire fox terriers continue to win. A wire fox from Brazil who had already won big in Europe became America’s top dog Tuesday night. The winner’s name is King. He is 7 years old. Wire fox terriers have won “best in show” 15 times at Westminster, the most important dog competition in the United States. That is far more than any other dog breed. Judge Peter Green pointed to King to confirm his victory. Green is a well-known person in the dog world, especially for his work with terriers. He has chosen King as the champion at other shows. Gabriel Rangel is King’s trainer. He said the dog looks “like a beautiful painting, a piece of art." “The way he stands and performs, he’s the whole package,” he added. 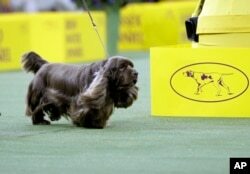 A Havanese named Bono came in second place among the more than 2,800 dogs who competed at Westminster. Also among the finalists were Bean the Sussex spaniel, Burns the longhaired dachshund, Wilma the boxer and Baby Lars the bouviers des Flandres. The crowd’s favorites were clearly Bean and Burns. Shouts of “Bean! Bean! Bean!” filled New York City’s Madison Square Garden. And Burns got loud cheers as his long hair flowed while circling the green walkway. But the night belonged to King. He remained completely in control under his handler Rangel, who won for the third time at Westminster. Rangel began to cry after winning. He said he was moved by the decision and by the recognition from Green. Rangel said it was a “special win because of that judge." King has many qualities that made him a likely Westminster champion. He has a good coat of fur. He has a beautiful way of walking. And he has a playful personality. 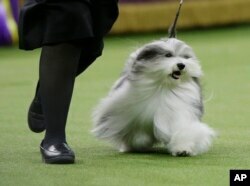 Tuesday night’s victory was the 47th "best in show" win for King, whose full name is Kingarthur Van Foliny Home. He has also been successful at the biggest dog show in the world, Crufts in England. breed - n. a particular kind of dog, cat, horse, etc.